For good old-fashioned family fun, look no further! 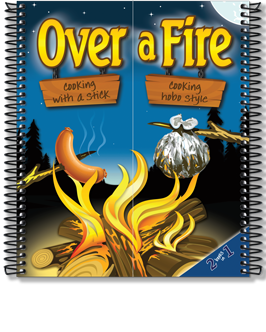 Whether you’re heading out on a camping trip or simply enjoying a backyard bonfire, this book will satisfy your appetite and provide hours of entertainment for the whole clan. Explore the sky, play a game or make a fun craft the whole family can enjoy. Then use a simple stick or pie iron or step it up a notch with foil pack options to create everything from breakfasts to late-night snacks. What can you do with a stick and some foil? Try goodies on a stick like No-Crust Apple Pie and Pineapple Cobbler, or wrap it all up with delicious meals of Fajitas in Foil and Sweet & Sour Chicken.